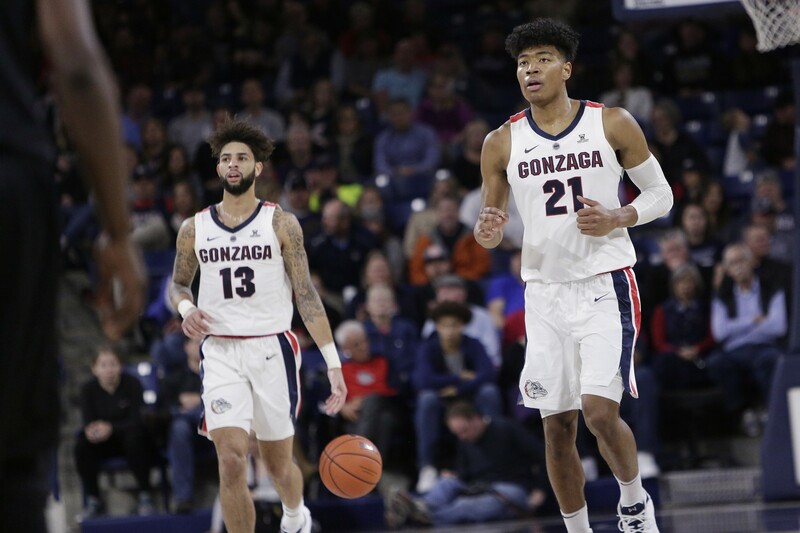 Gonzaga forward Rui Hachimura (21) and guard Josh Perkins were both vital to the Zags' win against San Francisco this weekend. The top flight 2018-19 Zags are back. After hitting a wall during the toughest part of one of their more rigorous nonconference schedules without likely NBA prospect Killian Tillie, out with injury, Gonzaga this weekend showed exactly what makes them a favorite to reach the Final Four and vie for winning the whole thing. And Tillie is a big part of that. After integrating the 6-foot-10 Frenchman with a home game against middling Santa Clara and a struggling Pacific, coach Mark Few showcased how Tillie unlocks the best version of his system against San Francisco this weekend. In Tillie's absence against teams like Tennessee, North Carolina, Duke and an aggressive defense like Illinois, Gonzaga struggled stretching opponents and creating better looks for their bigs. Having a frontcourt player with Tillie's perimeter shooting disrupts interior defenses hoping to stop Gonzaga big men Brandon Clarke and Rui Hachimura at whatever cost. That point was highlighted early in Saturday’s matchup against San Francisco, the likely WCC runner-ups. In the first 12 minutes of the game Tillie scored 10 points, including two three-pointers. Tillie still needs to work on avoiding foul problems, as he’s fouled out in two of the three games he’s played, but his return bolsters a defense and rotation that ultimately makes Gonzaga’s interior terrifying to game plan against. Substituting Tillie for Hachimura is an option that any coach in Division I would die to have. Josh Perkins also showcased a scoring skill set that has been mostly dormant since last season as he shifted his game from facilitator to dual threat with a couple clutch three-point shots against the Dons. When Perkins is looking to score from outside, the Zags' spacing and system is damn near flawless. Defenses have to choose between closing out on Perkins and hot-handed Zach Norvell, staying home and packing in the key to try and deny entry passes to Clarke or elbow isolations from Hachimura, or shadow the aforementioned power forward Tillie that averaged 48 percent from three-point territory last year. The win also highlighted the embarrassment of riches Gonzaga has in their frontcourt. We all know by now of the freakish physical abilities of Hachimura that makes him a lock for the NBA lottery, and it's likely Tillie will join him in the league after his junior season as well. But the season so far has been an argument for Brandon Clarke as the best player on the team. The measurables of Hachimura are absolutely undeniable and his game has progressed in an assuring way for scouts to lock him into the upper section of their draft boards, but nobody has effected games like Clarke has this season. He came into the night averaging 3.4 blocks per game and being heralded by college basketball writers like The Ringer’s Mark Titus as the best defensive player in the country. Clarke wasn’t able to match his average Saturday, only having one block. But it was a kind of an important one. His pin to insure the win may be the second best block college basketball has seen this year, finishing just behind another Brandon Clarke block. Time after time, Clarke showcases a combination of instinct and raw ability whenever he looks to challenge in the air on defense or offense. ESPN’s Jonathan Givony has Clarke now 23rd on his draft board, joining Hachimura at 13th and a recovering Tillie at 50th. Zag fans may need to start worrying about a third major piece on Clarke leaving early this year.